Thanks to all of you who came to the Band Parent meeting last Tuesday in the rather warm auditorium. It was great to see parents who are now returning to the group with their younger kids and getting to meet parents of soon-to-be high school band students. Mr. Barton presented the basics of what to expect for returning and incoming band students and an overview of the fall marching show. There were a lot of great questions and suggestions from the parents and Cynthia and Jamie gave us an update on the Rutherford Challenge – we’re almost there! I’ll try to get the exact numbers for you by the next email. For those who couldn’t make the meeting, there are new resources on the Mac Band website that will provide some basic information. Click to take a look. 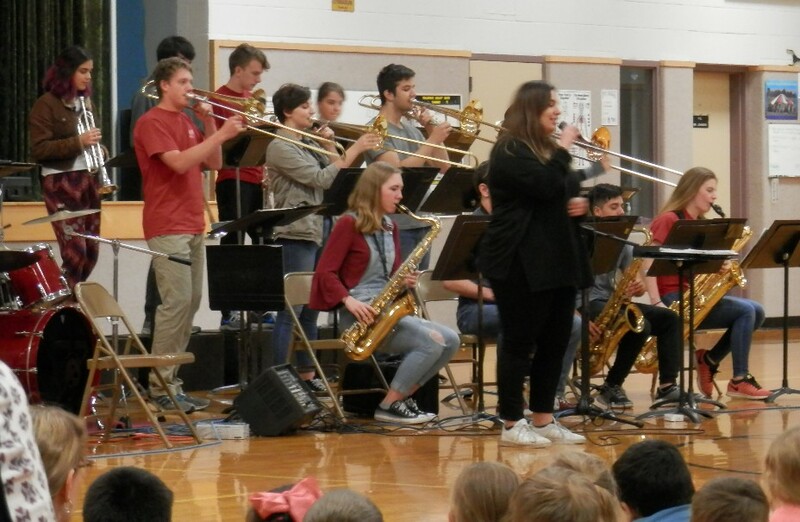 Then on Friday evening, the Jazz Band played a concert with Lynn Marchant Ballet Theatre and Oregon Children’s Ballet Theatre. Towards the end of the evening of music and dance, Mr. Barton surprised everyone when he joined Laura Tuckett in a flag routine. Where else are you going to find Jazz, Ballet, Color Guard and a cute dancing shark on the same stage? The only performance I’m aware of for this week is the Alien Day Parade on Saturday. This year the Middle Schools and High School will each have their own marching ensembles. And while there are no evening activities scheduled, next week there are High School music performances almost every night with the Twilighters, Choir, and Jazz Band each having concerts in the auditorium.